Keto Cacao Hazelnut Bars contain only four ingredients: organic cacao, erythritol, hazelnuts, and MCT oil powder. These bars are rich in fats and sugar-free. One box contains 10 bars of 50 grams each. High-quality chocolate is both delicious and healthy because it is rich in healthy fats and other beneficial compounds. Unfortunately, most chocolate also contains large amounts of sugar and additives (such as dairy products) that are not suitable for everyone. Keto Cacao Hazelnut Bars are high-quality chocolate bars. They are made from just four ingredients: cacao, erythritol, hazelnut pieces, and MCT oil powder. You can enjoy these bars even when you follow a low-carb, vegan, paleo, LCHF or ketogenic diet. Cacao is the most important ingredient in chocolate. The cacao in Keto Cacao Hazelnut Bars is organic and comes from one specific region. Additionally, this cacao is classified as Fino de Aroma. This label indicates a consistent flavour due to careful selection of cacao varieties, trained cacao farmers, and processing of the cacao. The flavour of Fino de Aroma cacao is less acidic and milder than other varieties. 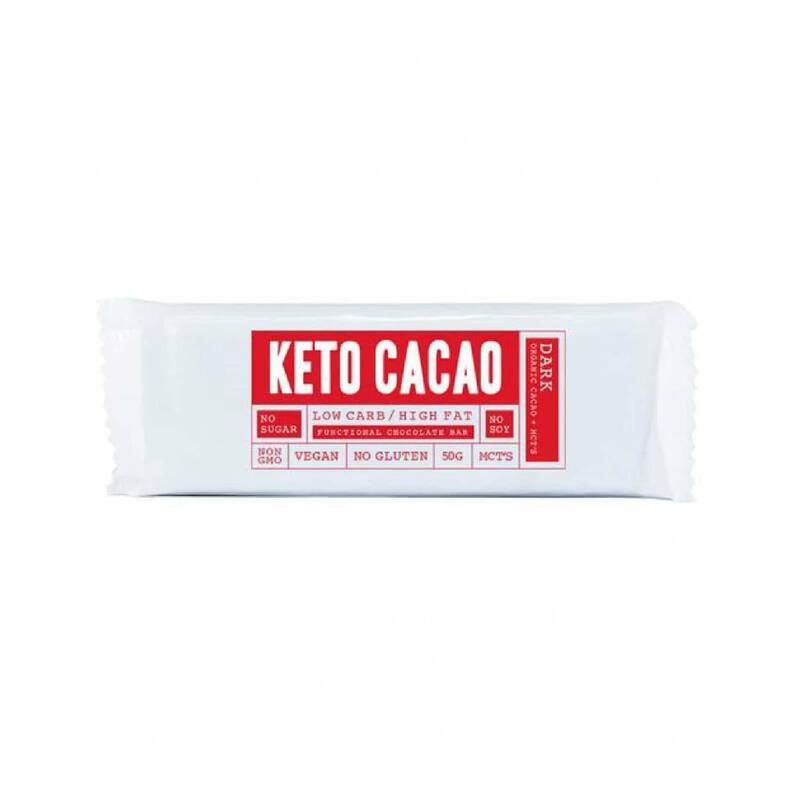 This new formulation of the Keto Cacao bars uses Fino de Aroma Tumaco cacao. This cacao blends particularly well with the MCT oil powder for a great flavour. In addition to the healthy fats naturally found in cacao, every Keto Cacao Hazelnut Bar contains at least one teaspoon (5 mL) of MCT oil. MCTs (medium-chain triglycerides) are water-soluble and quickly absorbed by the body, where the MCTs are available for fat metabolism or ketone production. Keto Cacao Hazelnut Bars also contain coconut pieces, which give the bar extra crunch and a subtly sweet flavour. The new Keto Cacao bar formulation contains MCT oil powder with acacia fibres instead of MCT oil. The MCT oil powder causes less digestive discomfort and tastes great with the new cacao selection. Keto Cacao Hazelnut Bars are sweetened with the natural sweetener erythritol. Erythritol does not raise blood glucose levels. For this reason, these chocolate bars fit into low carbohydrate diets. One package of Keto Cacao Hazelnut Bars contains 10 bars of 50 grams per piece. 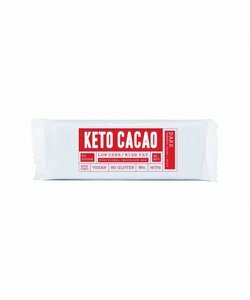 Keto Cacao Bars are also available without hazelnuts, as the Keto Cacao Dark Bars and Keto Cacao Coconut Bars variants. Warning: Excessive consumption of Keto Cacao Hazelnut Bars can have a laxative effect due to their erythritol content.